Today’s post is very exciting. Whenever I talk about highlighters, blushes or lipsticks excitement automatically creeps in. I always thought “highlighting” was just a phase and like a fashion trend this phenomenon will die down as well. But, it seems to be getting bigger, better and bolder. Nowadays, every other brand is coming out with highlighters and we get pretty good ones at the drugstore even. But, today I want to write about an oldie but a goodie. 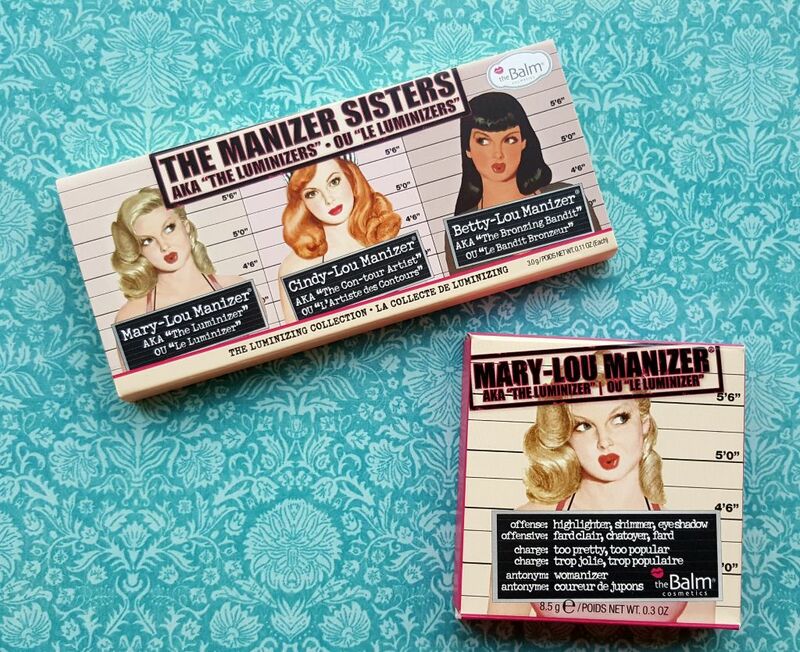 I think this is one of the first highlighters I heard about which everybody was raving – theBalm Luminizers out of which Mary-Lou Manizer seemed to be the most popular one. At one point, everybody was talking about these and I am sure a lot of you own at least one of them. I had swatched this long time back in Sasa Singapore but somehow I didn’t end up buying it. I guess back then I thought that it was just too much to pay for a highlighting product, do I even highlight that much? So, I went on with my business but that swatch of Mary-Lou Manizer was always at the back of my mind. Quite some time passed, and I started to warm up to the idea of highlighting. Back then, there weren’t many good ones (cheap ones rather) available at my local drugstore. The first highlight which I tried was from a Sleek Makeup contour kit and I loved the whole idea. I realised, highlighting does give the face an instant glow. I, of course, went in with a very light hand and just loved the subtle luminosity my face suddenly got. 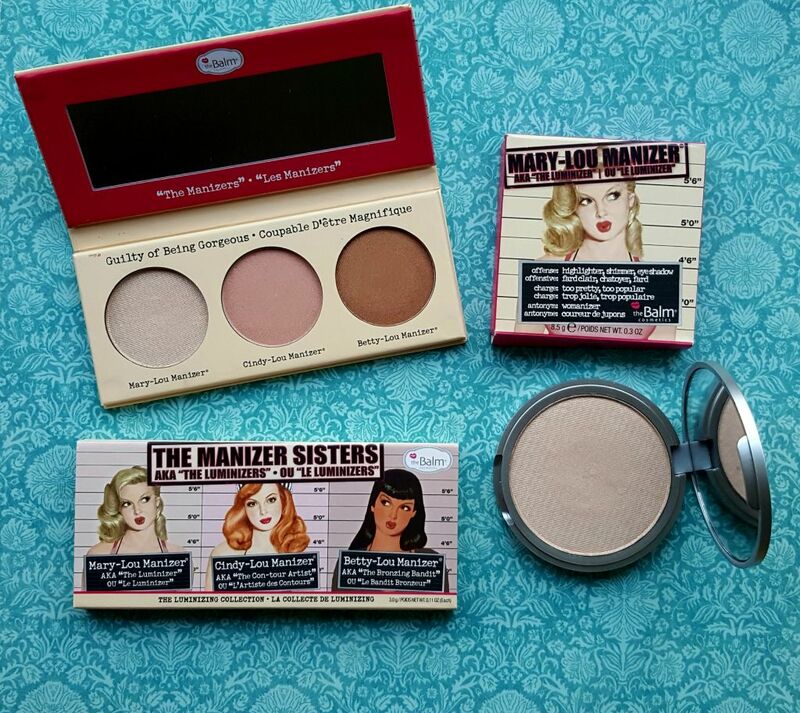 So, I went in hunt of the every popular, hard to get – Mary-Lou Manizer. I searched everywhere, online, offline and it was sold out everywhere! I Kicked myself hard about not buying it the first time and almost as an act of repentance bought the supremely expensive Becca Highighter “Champagne Pop” (I used some of my Sephora points, that was some solace). It is, of course, amazing and I will blog about it some other day. 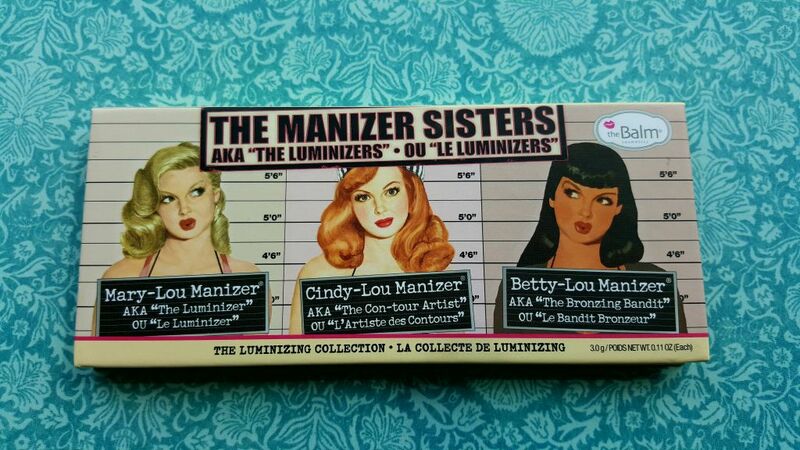 But, today its all about the Luminizers. Finally after months of wait, I finally had the Mary-Lou Manizer (It is so hard to get the spelling right! lol) and needless to say I loved it. And after few more months of wait, I finally have my hands on the palette which has all the three luminzers. I couldn’t be happier. 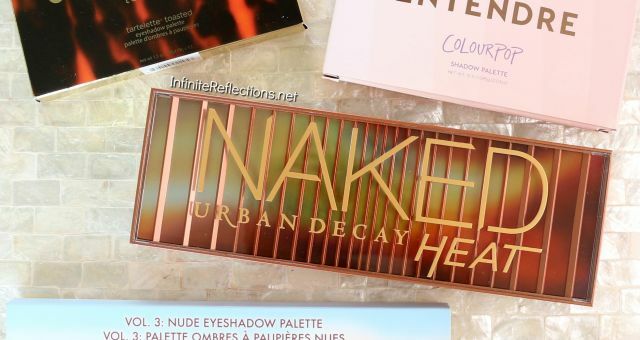 I think the palette is still sold out in Singapore. I had my sister get it for me from the US and it is obviously much cheaper there so a win win. Yay! 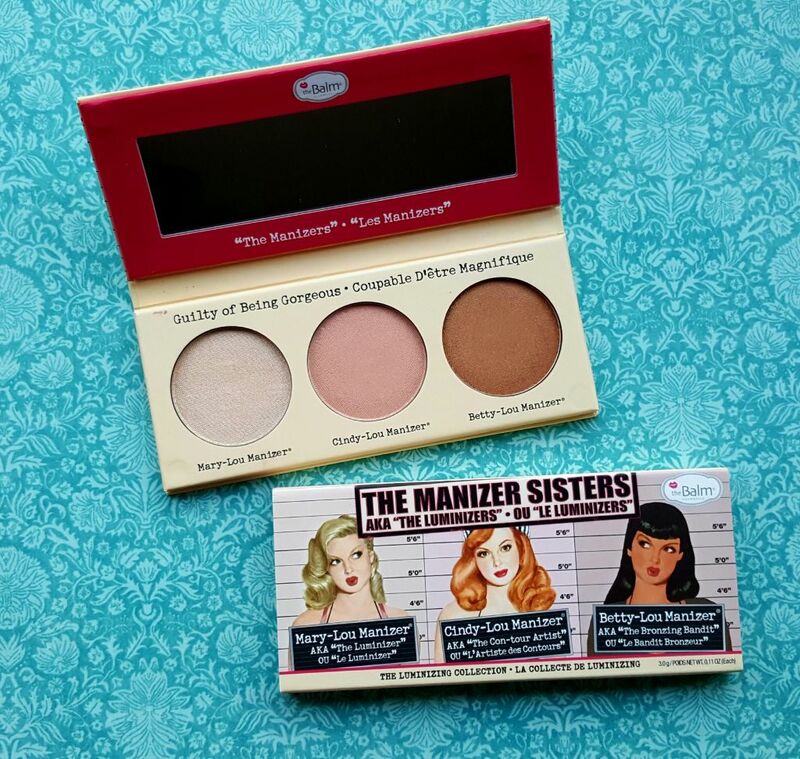 Anyways, let’s review and swatch these beautiful highlighters now – theBalm Manizer Sisters Palette. First and foremost, I am not that person who judges the product based on packaging. Packaging is quite secondary to me and often times I don’t even notice the packaging. 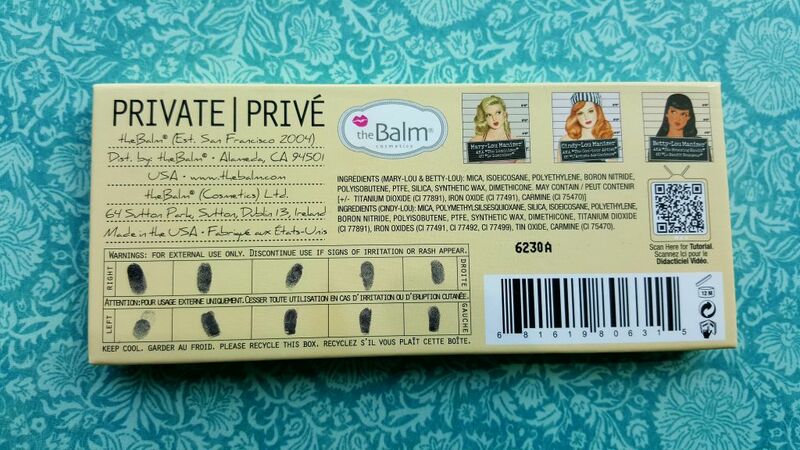 But, theBalm always bowls me over with the packaging of their products. It is just out of this world… cute! Even a person like me can’t go past the packaging and have to admire it for a while. There are a lot of flips involved before I actually open the product. 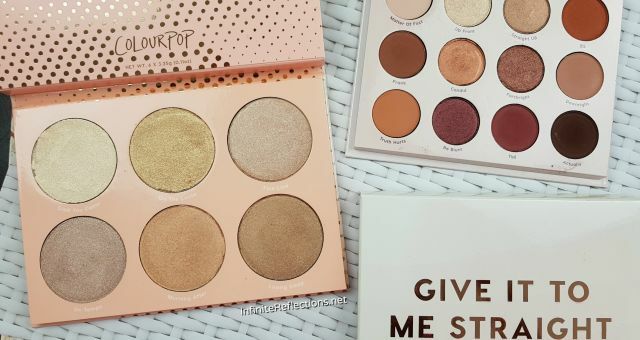 As always, this highlighting palette is also very sleekly packaged with all the three luminizers – Mary-Lou Manizer, Cindy-Lou Manizer, Betty-Lou Manizer in a cute little handy palette which even has a small mirror. Comes in handy. I still haven’t been able to decide which one of the three highlighters in my favourite. All of them work beautifully on my skin tone. 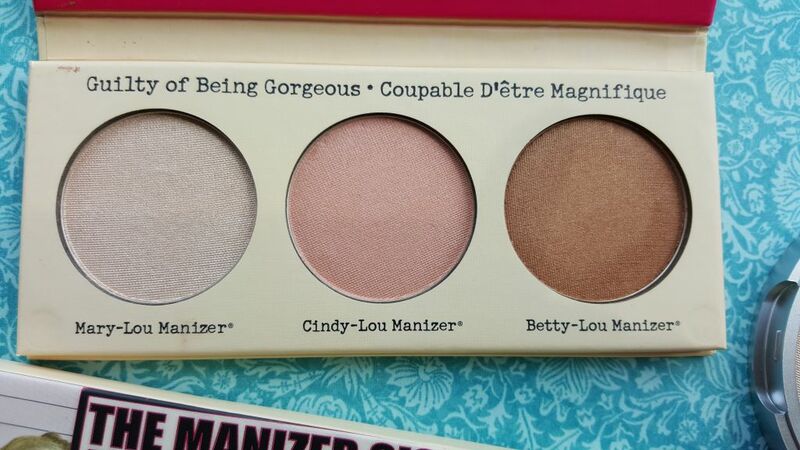 Mary-Lou Manizer is a very chic creamy silvery highlight, which somehow works beautifully on my skin tone. White-ish highlights tend to look a bit weird and too obvious on my skin tone sometimes. This doesn’t do any of that. You probably know by now how much I love this highlight. But, the other two are also no less, although they are still quite new to my collection. 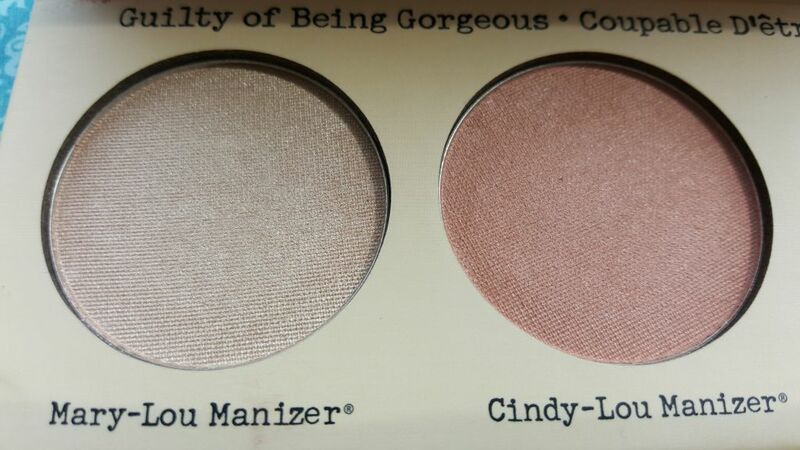 Cindy-Lou Manizer is more of a pink-y rose gold sort of a highlight which still works on my skin tone. Just looks amazing. 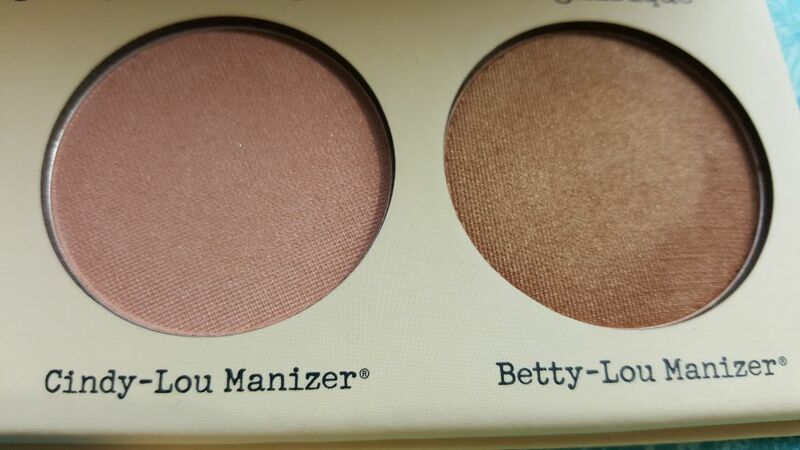 Betty-Lou Manizer is this bronzy coppery highlight which gives a warm glow to the skin. Its stunning as well. 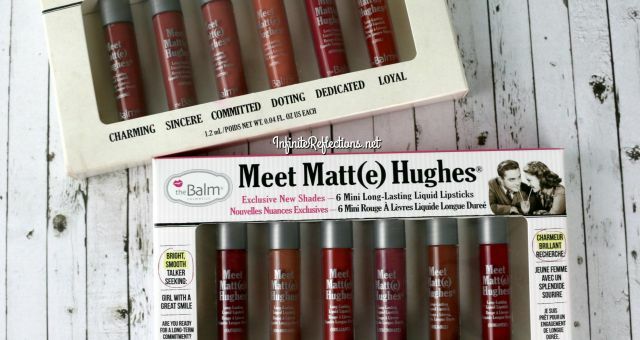 All of them have a beautiful formula, very smooth, pigmented and buttery and they blend like a dream. This definately is one of the best highlighting formulas I have experienced. I can get a very subtle highlight with a light hand and get quite an amazing perfectly balanced intense glow if I layer it. There is a subtle increase in the intensity with every layer but still everything remains very smooth and well blended and doesn’t look patchy or overpowering in any way. It is just smooth luminosity, absolutely beautiful. Above, you can see the swatches from left to right – Mary, Cindy and Betty. 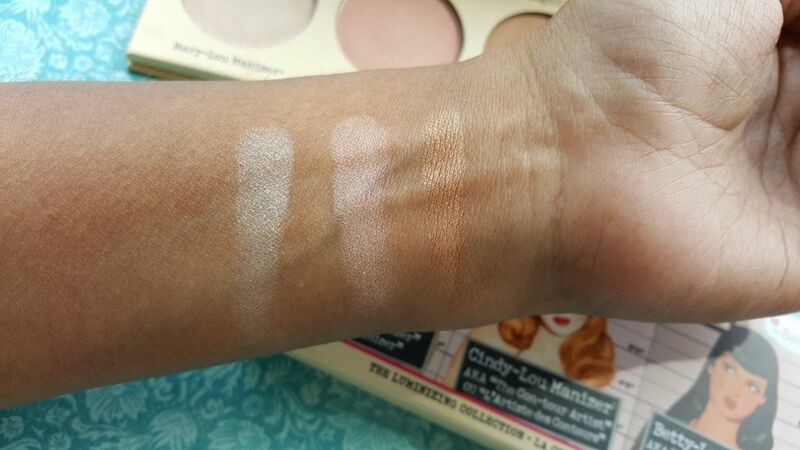 The swatches look pretty intense but they blend away super nicely and will give a very smooth glow. Also, here is a comparison of the pan size of the actual individual highlights to the ones in the palette. An individual highlight is 8.5 gm / 0.3 oz, whereas an individual pan in the palette is 3.0 gm / 0.11 oz. 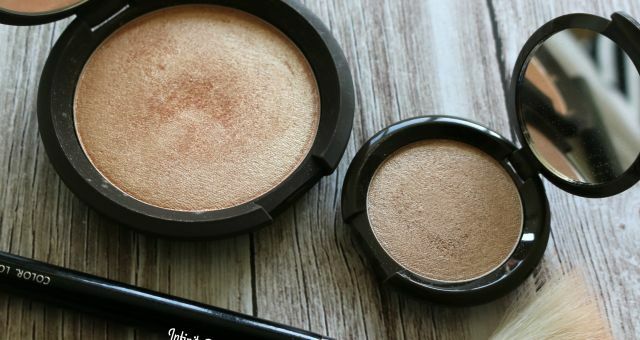 I think in both the products, you are getting a lo..oot of highlight and I am not sure if I will ever hit pan, because you really need a tiny amount of this, well at least me. At, 28 USD, I think the palette is an excellent steal, where you get to try all the three shades of the luminizers. An individual highlight is priced at 24 USD, which, by the way, I think is totally worth it! To end the blog, I would say that whichever way you choose to own these highlights, I am sure you are not going to regret it. I am just happy that I finally have my hands on these beauties.